June | 2013 | Let Teddy Win! 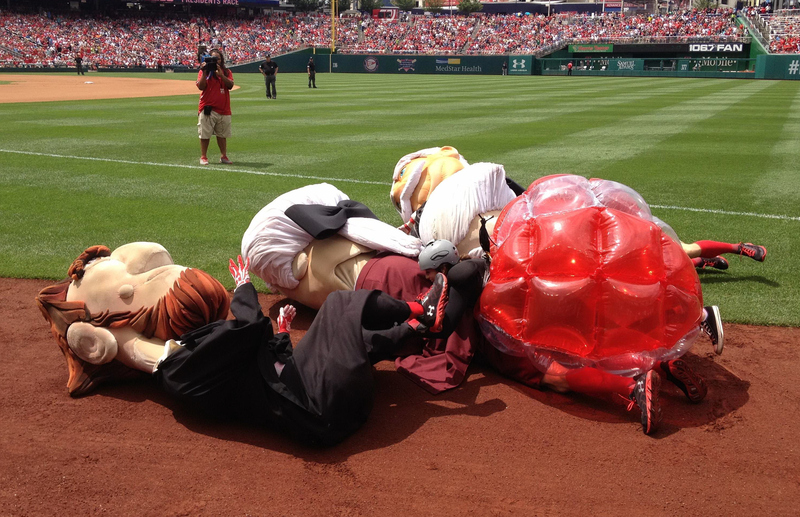 The Nats racing presidents hopped on the latest viral sensation Wednesday night at Nationals Park, introducing Prancersize to the home crowd. 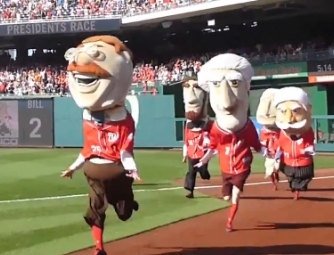 On Wednesday, with Abe Lincoln in the lead, the presidents were interrupted mid-race when the ubiquitous Prancersize fitness video appeared on the Nationals Park HD scoreboard (if you haven’t seen it, see below). 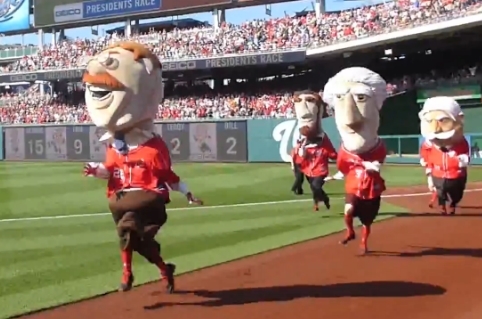 The presidents stopped, watched for a moment, and then Prancersized across the finish line. 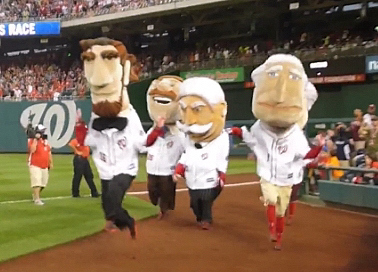 Last year the presidents became a viral sensation themselves when Teddy Roosevelt led them in a Gangnam Style dance during the season and again in the playoffs. Let’s hope this one doesn’t have quite the same lasting power. Video: Abe Lincoln pays homage to… Sweden? 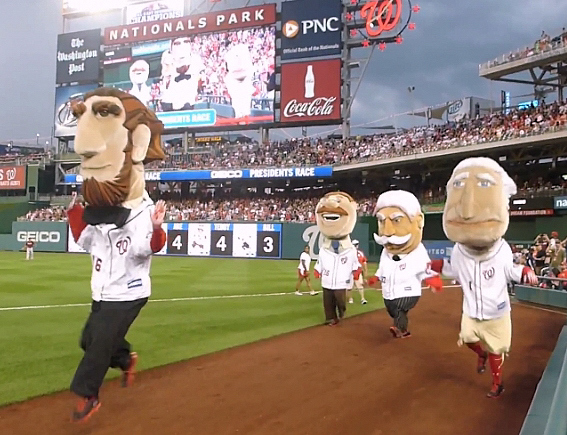 On a forgettable Saturday for fans at Nationals Park, the racing presidents ran a forgettable presidents race, with Abe Lincoln returning to his form of previous years by pacing the field. In victory, the Great Emancipator waved a tiny Swedish flag as he paraded before the confused fans along the first base line. He was apparently paying tribute to Sweden, which adopted its flag 107 years ago today. 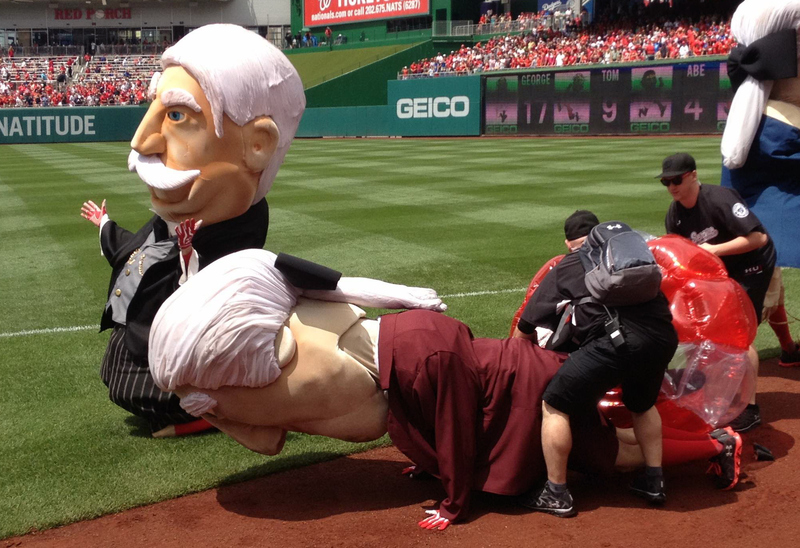 William Howard Taft got some unlikely assistance as the Nationals racing presidents kicked off the first day of summer in style Friday night at Nationals Park. With Stephen Strasburg mowing down the Colorado Rockies to lead the team to its third straight victory, the nearly 35,000 fans in attendance were able to celebrate the change of seasons as a sign of renewed hope for a Nats postseason run. 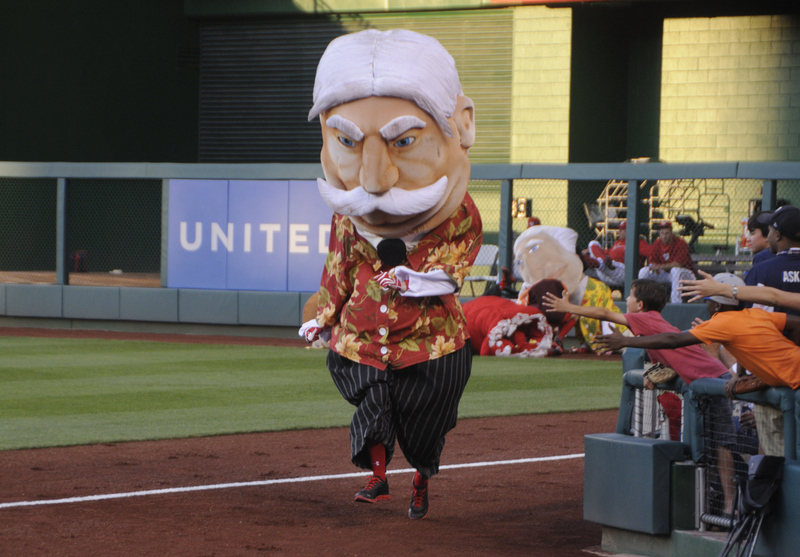 Marking the occasion, the racing presidents emerged for the fourth inning race wearing colorful Hawaiian shirts, but the summer fabric apparently wasn’t enough to cool down the portly William Howard Taft, who stopped at the bullpen door to invite Kool-Aid Man onto the field. Mr. Kool-Aid exchanged high fives with Taft, then turned and tackled all of Tafts competition, knocking them collectively from the race. The Big Chief trotted unopposed to the finish line. Nearly 32,000 fans welcomed the Washington Nationals home from a lengthy road trip Thursday night as part of the team’s Army Night military celebration. The evening was chock full of military tributes, highlighted by a first-ever racing presidents Army obstacle course. 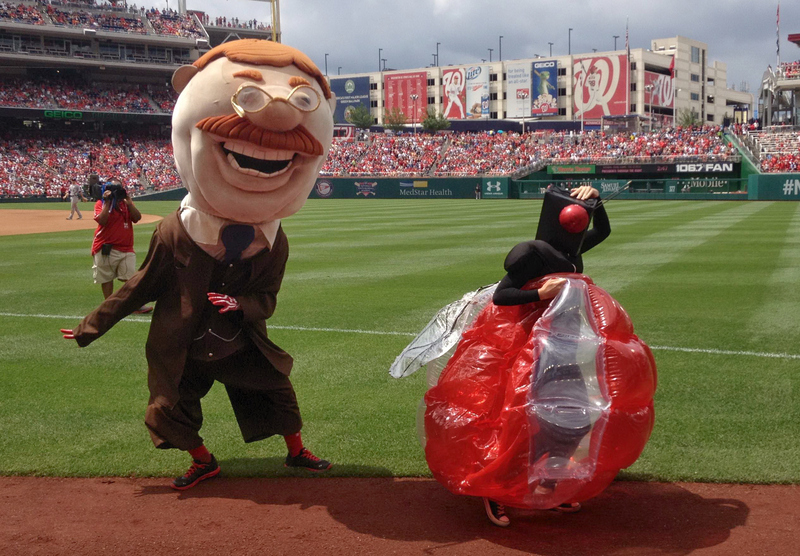 Former Army Colonel Teddy Roosevelt had no trouble with the hurdles that opened the fourth inning race, but TR met his end at the next stop. Each of the other presidents tackled the weightlifting obstacle, but Teddy proved unable to lift the weights (marked “200”), and failed to continue as Taft dashed ahead. 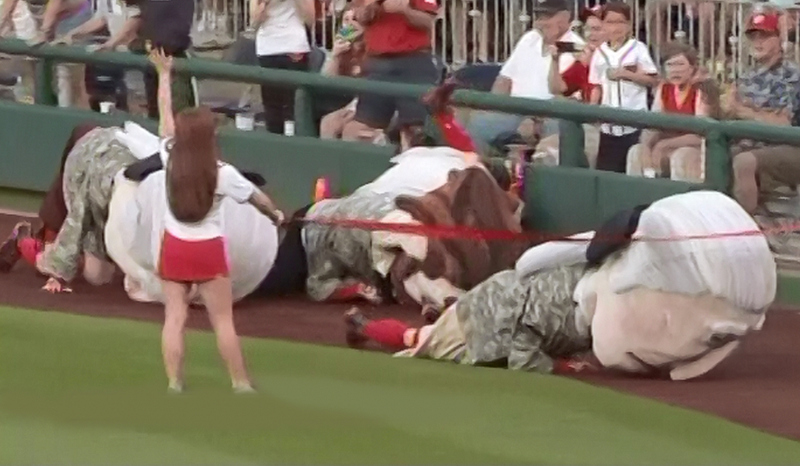 The final obstacle, a classic Army Crawl, proved to be the portly Taft’s undoing. 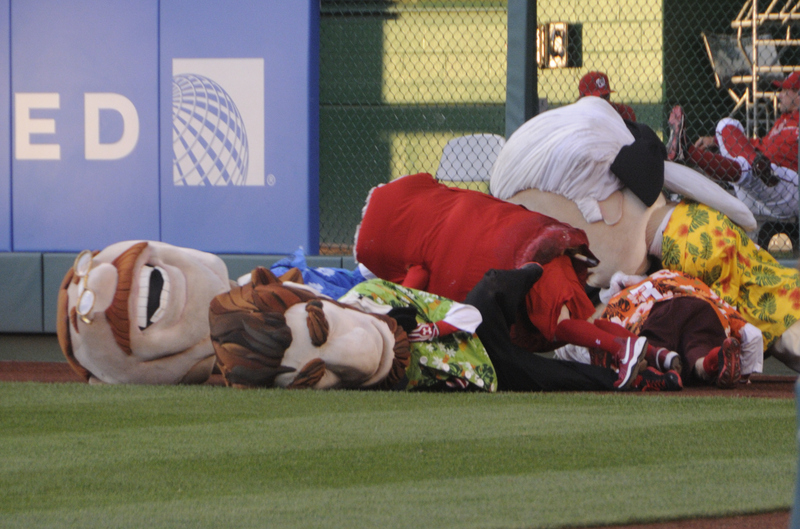 As the Big Chief keeled over, first Commander In Chief George Washington crawled ahead on elbows and knees, and took the series opener. Seventeen year Cicada Brood II has been swarming the Virginia suburbs southwest of DC, leading some to wonder whether Nationals Park would soon be affected. The answer arrived during the first game of Sunday’s day/night doubleheader in the form of the largest cicada spotting of the season: the six foot variety. 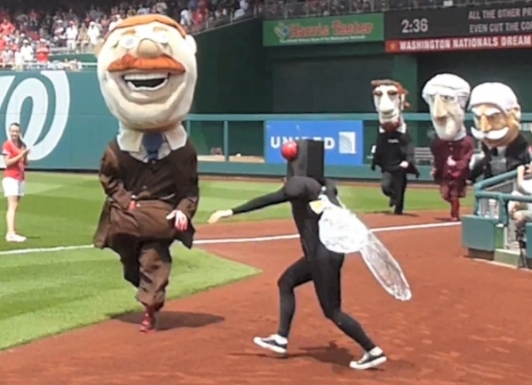 In the fourth inning of game one, Teddy Roosevelt emerged last from the presidents race starting gate, but quickly grabbed the lead and appeared to be on the way to his second straight victory. But lurking in the stands was the very adult-size cicada, who jumped into the Rough Rider’s path and tackled him to the ground, following it up with a vicious body slam as George crossed the finish line. 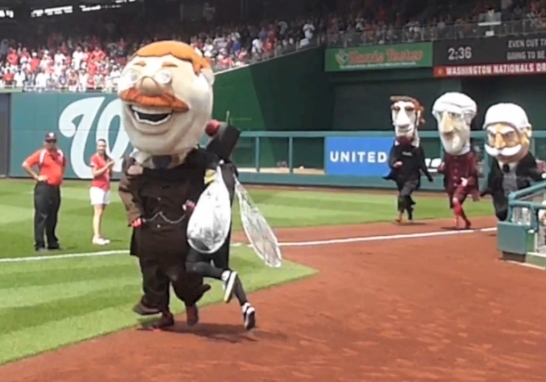 When the presidents returned Sunday evening for the second game of the doubleheader, Teddy was prepared, racing from the start with a giant flyswatter. Teddy’s new nemesis appeared as suspected, but was not intimidated. The cicada met him in the outfield, grabbed the flyswatter, and beat Teddy to the ground. 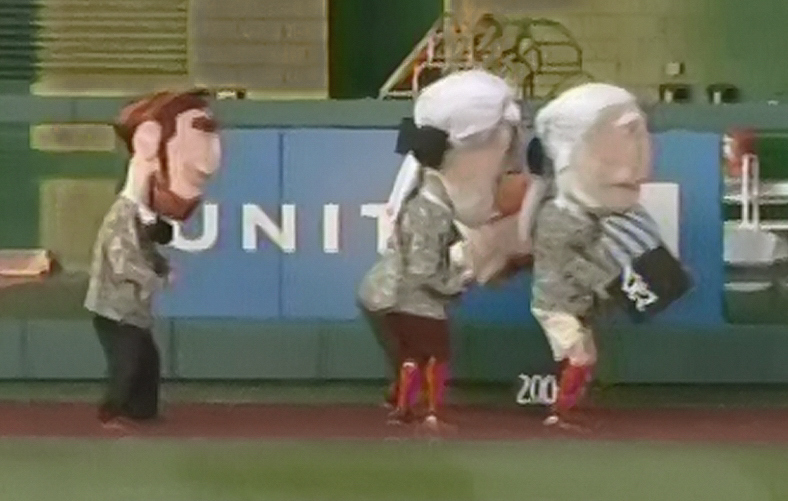 Abe Lincoln took the win. Video of the first race below, plus a slo-mo version of Teddy’s takedown.